Born out of the desire to inspire, educate, entertain and equip the current and future generations of leaders. We believe Africa has an overwhelming supply of talented youth who are proud of their continent and are keenly aware that Africa will be a leading voice in shaping the future. From South Africa to Nigeria to Kenya, the entire continent has the collective resources and scope to be an economic force as the world shifts from a western focused paradigm to a world where Africa stands for principled prosperity. 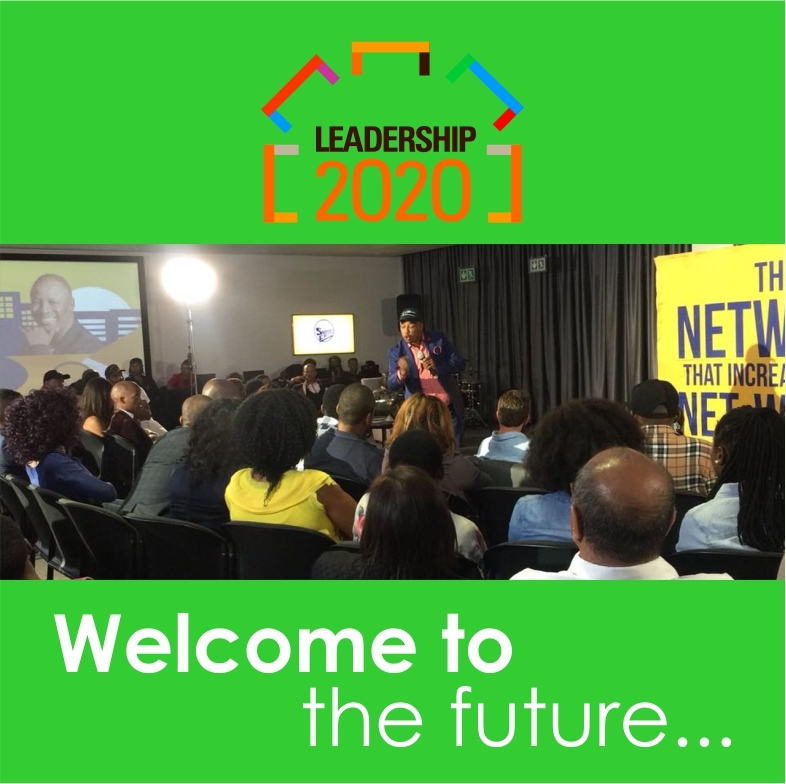 We gave birth to Leadership 2020 because our founders understand the youth and their burning desire to be unboxed from tired stereotypes and be seen for the great people they are… and we understand their thirst for balance – where learning can be rewarding, fun, transformational and rigorous at the same time. We aim for sustainability and with principled, purpose driven partnerships. We will be the go to body of leadership answers for those considered ‘youth’ ‘now generation’ from South Africa throughout the continent and the world. Our movement will be the preeminent ‘go to’ resource for how to develop and deploy, enterprising, innovative, thinkers, who do what is required to balance the socio-economic status quo! Africa’s youth are restless but ready to lead. Consider the generation like dried plants who consistently need water and nutrients to shine and stand tall. We are talking about the generation who don’t see the need to strike, but have the passion and desire to educate them-selves and grow amongst the same purpose-serving individuals. This is not a cult, but it is a positive change movement, unapologetically bold in its desire to help others. Leadership 2020 will fill the void of serving content and clarity on youth leadership. We will radically inspire, educate, entertain and equip youth leaders on multiple platforms – inspirational talks, seminars, DVDS, music, poetry, Curriculum, Leadership 2020 entrepreneurship school, social media, Apps and of course featured traditional media such as radio, newspaper and television content. Dedicated to the mission of meeting African Youth where Their heartbeats. Help them grow into the world’s greatest leaders by employing the highest degree of integrity and professional excellence with inspired ideas & education, shared execution, and a network that increases their net-worth. Bold, Proud and Connected to the extraordinary richness of African genius and determined in our efforts to position African youth for greatness. We promote intellectual swagger, which means that it’s cool to be smart and to be hungry to learn more while growing and shaping your future. To be the accessible voice, resource and solution. A launching pad for Africa’s potential with customized touch points to intersect and meet new followers. To serve at grassroots level and ensure industry leaders always remember to remain connected to the deepest desires of their hearts. Help paint a picture of your future and fit yourself in it! We always give first. All partners and projects will participate with a giving heart and as platforms and proceeds develop, we will formalize relationships where all partners are measured in contract / partnership deliverables against a greater good for the target follower. To be globally influential while serving, shaping, grooming and building Africa’s star thinkers and doers. Our Model is clear. We will engage two tiers of youth. Tier 1 – Studying Youth (13-21yrs). Tier 2 – Working Youth (21-40yrs). COLLECTIVISM – We are all different and Africa richest talent is displayed in the line up of Leadership 2020. AFRICAN FIRST – We first think and apply our-self to our home territory, Africa, we inspire the world but make impact with real homemade product. INTEGRITY – A promise we make we try our best to keep, we make commitments with our actions not our words; we build each other and offer genuine love. TREND-CENTRIC – In the world we have reality and augmented reality, Leadership 2020 is clean cut and designed like an open book, we are setting the trend for network driven, inspired, learning culture which translates into a rise of the thinker and doer who has invested time to grow exponentially through the process and environment created. RADICAL CHANGE – It is inevitable that with the advocacy of leadership, consistent learning, sharing and growth culture, that the net result is a transformed individual, couple, family, business and community. RESEARCH – The value proposition from our efforts in building tomorrows leaders is inspired by the passion to document it, share it and teach from it. The process of the evolving pioneer thinking is one, which future generations including the immediate will learn, study and grow from in the future. OUR VOICE – To be the broker between youth, corporate, government and media, advocating Leadership, integration, application with rich results for the economy and the social impact uplifts a poverty driven mindset.